Steve Verheul, Canada’s lead NAFTA negotiator, appeared before the Standing Committee on International Trade earlier this week to provide an update on the negotiations. 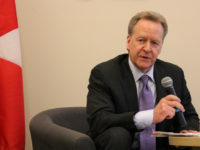 In addition to confirming Canada’s commitment to a cultural exception (Verheul acknowledged that the U.S. “has not reacted positively”), Verheul was asked about the digital trade chapter. He indicated that there has been significant progress on issues such as online consumer protection and privacy. He also touched on two other issues: one a Canadian ask and the other a U.S. priority.